EUR was empowered by the Mario Draghi’s comments on Friday and at the same time USD was being supported by the US economic reports. 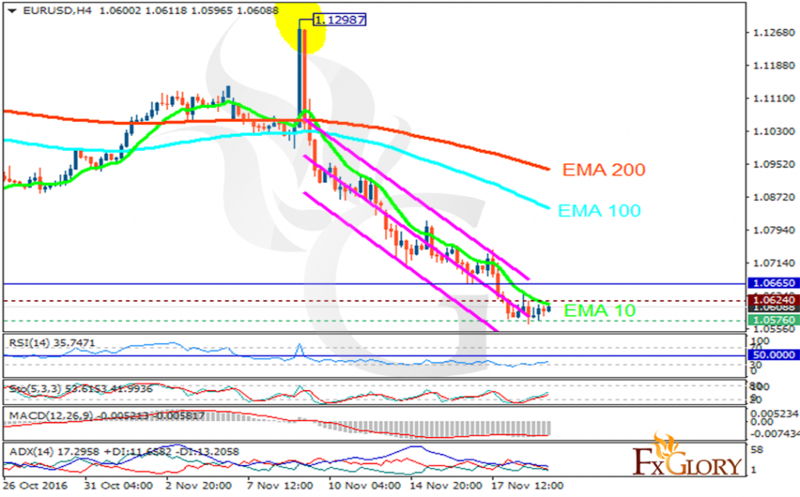 The support rests at 1.05760 with resistance at 1.06240 which both lines are below the weekly pivot point at 1.06650. The EMA of 10 is moving with bearish bias along the descendant channel and it is below the EMA of 100 and the EMA of 200. The RSI is moving in oversold area, the Stochastic is showing upward momentum and the MACD indicator is in negative territory. The ADX is not showing any clear signal. EURUSD will start its upward trend soon targeting 1.0700 area.